Built 1975-1979 by Frank Krayenbühl. Opened 5 Oct 1979 as "Theater am Stadtgarten" with Mozart's opera "Die Zauberflöte". Later renamed "Theater Winterthur". Used for touring performances (official name: "Theater Winterthur - Das internationale Gastspielhaus"). Up to 822 seats. 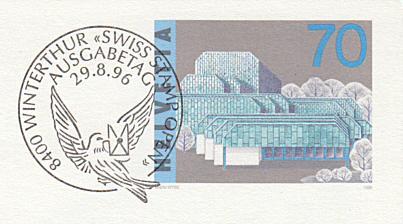 Postmark: "8400 Winterthur 'Swiss Stamp Open' Ausgabetag 29.8.96"